Whether you’re overseeding an existing lawn, thinking about establishing a new lawn or reseeding bare or thinning spots, it’s important to know what kind of grass you currently have growing. For many homeowners there doesn’t appear to be much difference between grass species at first glance. It’s not until they’ve used tall fescue to fill in a bare spot in the middle of their Kentucky bluegrass or overseeded Bermudagrass into their fine fescue lawn do they realize the error of their ways. While some grass species are okay to mix, blending together other types will result in a “patchwork quilt-like” look. Each species has its own growth habits, maintenance requirements, texture and shade of green. Luckily, identifying your existing grass is fairly easy once you’ve learned some key characteristics. While you may not impress members of the opposite gender with your grass identifying skills, at least you’ll know what kind of seed you need for your next project. Kentucky bluegrass is the most popular grass used for lawn in the United States, and for good reason. It creates one of the most high-quality lawns possible. Its soft velvety texture, deep green color and tolerance to heavy traffic make it one of the best choices for yards, sports fields and campuses. Kentucky bluegrass has a dark-green color and a spreading growth habit. The most obvious identifying characteristic is the kneeled canoe-shaped leaf tip. It also has a prominent midrib (vein) running up the middle of the leaf blade. If left unmowed, Kentucky bluegrass will produce an open, branching panicle-style seed head. Perennial ryegrass is a popular choice for cool coastal regions of the United States. Its quick germination rate and traffic tolerance make it appealing where a fast, durable groundcover is needed. Perennial ryegrass is mostly used as an additive to Kentucky bluegrass seed mixes and for overseeding southern lawns in the wintertime. It’s very similar in appearance to Kentucky bluegrass and most people have a difficult time telling it apart. One of the key identifying characteristics of perennial ryegrass is the back of the leaf blade which is very shiny. You can also pull some grass out of the soil and look at the base of the stems. If the stem base is a reddish purple, it’s perennial ryegrass. When left unmowed it forms a compact spike-like seed head, much different than the Kentucky bluegrass seed head. 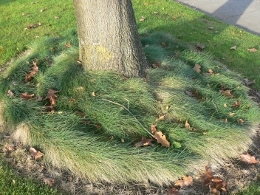 Fine fescue includes many species of fescues which all have similar appearances and growth habits. These grasses are most commonly used in cooler climates. They are the most shade-tolerant lawn grasses and fairly easy to differentiate from all other grasses. Their most distinguishing characteristic is their very narrow, finely-bladed leaves. They can also have a lighter green color than other grasses. Fine fescue is okay to blend with both Kentucky bluegrass and perennial ryegrass in small, evenly-distributed amounts although it may be noticeable when concentrated into patches. 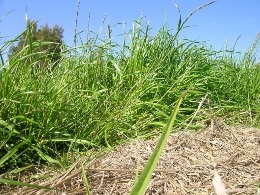 Turf-type tall fescue is one of the most flexible, durable grasses available. It handles heat and drought better than other cool-season grasses and is considered traffic tolerant. It’s found in almost every state and is the best choice for transitional zones. 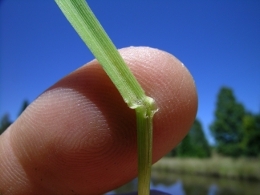 Tall fescue can be identified by its wide leaf blades that have equal-sized veins. It has no prominent midrib. When left unmowed it forms a panicle style seed head containing six to eight seeds. Tall fescue should not be blended with any other grass species. 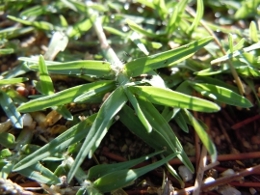 Bermudagrass is commonly found in southern states from California all the way to Florida. It’s an aggressive, durable grass that handles traffic and drought well. It thrives in the summer heat and goes dormant during the winter months. Bermudagrass can be identified by its coarse texture and aggressive above ground roots known as stolons. 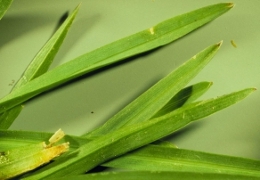 It also has small hairs where the leaf blade meets the leaf sheath. Its most distinguished characteristic is its seed head which resembles a bird’s foot. Bermudagrass should never be blended with any other type of lawn grass and is considered a weed in cool-season grasses.